I recently had the most fun trip...ever! My friend, Dede, and I, along with her son, Carter, took a trip to the Northeast. We plowed through five states in seven days. It was a whirlwind trip, exhausting but exciting. If you consider that two of the days were primarily spent in airports, it really was a lot to cram into one trip, but so worth it. The first day, we flew into Boston, so that is where our adventure began. 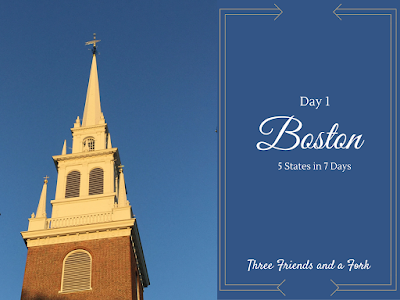 As soon as we left the airport we headed straight for Boston's Quincy Market and Faneuil Hall. I know what you are thinking. We are two history buffs, but no. While we were interested in the history of Boston, we were really interested in Wicked Good Cupcakes! Since we are both fans of Shark Tank and cupcakes, we were really curious to find out what was so good about these cupcakes in a jar that made Mr. Wonderful want to invest in them. Mr. Wonderful heard we were in town and just had to have his picture made with us! My cupcake was a chocolate sea salted caramel cupcake which involved chocolate cake layered with drizzles of homemade caramel sauce, sea salted cream cheese, butter cream, and caramel frosting. It was just as rich and good as it sounds. Dede had the signature Wicked Good Cupcake, which was baked peanut butter and chocolate chips layered with peanut butter frosting and chocolate ganache. It was even richer than the cupcake I had. Carter had more than one cupcake and I can't even remember what they were, except that he really, really liked them. He and I were both wishing we could try the Cuckoo for Coconut cupcake, but they were out of them while we were there. The flavor sounded really good, though. I may have to order one! The cupcakes are a bit pricey, but each jar is equivalent to two regular sized cupcakes and will last for ten days without refrigeration. You can do like Dede and I and nibble on them for a few days or like Carter and gobble the whole thing down in one sitting. Up to you! We strolled along the Freedom Trail for a bit, enjoying the history and architecture. We saw the Old North Church and other historic buildings that were around as America was becoming a nation. 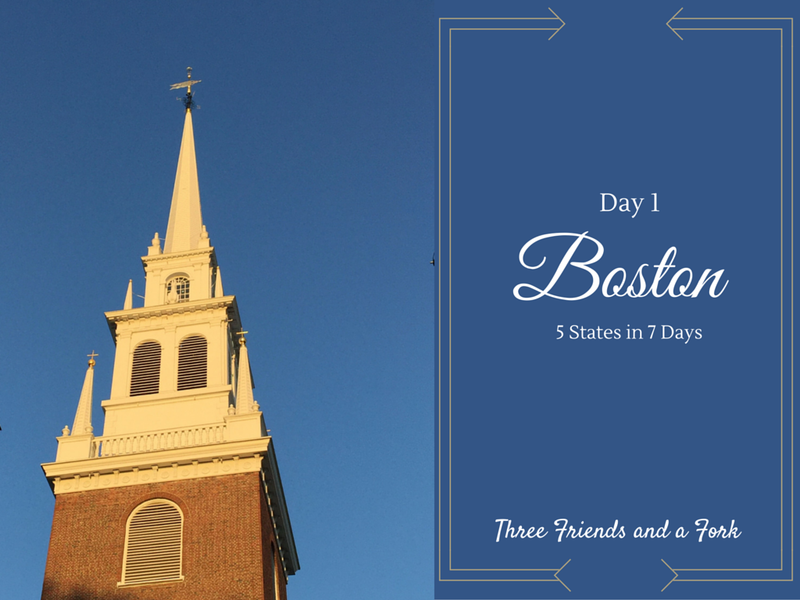 There is so much to see and do in Boston, that we could have easily spent our entire week in Beantown, but we had other plans. Next, we hopped an Uber ride (you already know what an Uber fan I am) over to Boston Childrens' Hospital, where Carter had heart surgery when he was just a newborn baby. What a success story! I'm willing to bet folks who work in hospitals that treat infants are really happy to see the children come back years later and in such great health. We really appreciate our hard-working health care providers. After checking out the hospital and realizing a lot of what Dede remembered had been torn down or renovated, we took a few pictures and decided it was time to eat dinner. In my research, I had seen something about a Boston restaurant with a cool oyster shell wall and I'm not going to lie, my curiosity was piqued. Now, why I thought the name of it was B&G Oysters is beyond me, because B&G Oysters does not have an oyster shell wall. Trust me, I looked at every single wall. What B&G does have, though, is really good food, so it turned out to be quite a happy mistake. It was a busy night, but we were quickly seated in the crowded restaurant. Happily, we got to sit at the bar and watch the chefs work. Here's a tip. If you go, ask to sit at the bar. The inside is small and there is outdoor seating, which might be fun on a pleasant night. However, the first time you go, try sitting at the bar. It is very entertaining, at least for me it was. I really enjoyed watching the chefs work their magic, a form of dinner theater, if you will. Dede chose a roasted corn cake with king crab, lobster butter and red wine gelée. I loved my lobster BLT, but, honestly, her corn cake was even more amazing. I would order it again in a heartbeat. As we left B&G Oysters, with half a sandwich and renewed energy, we made one last stop before leaving Boston. We decided to mosey on over to Fenway Park to snap a few pics. Fenway is more like the midway at a carnival than it is a baseball field, at least from the part we saw. I'm not much of a baseball fan, but I'm glad we went by for a visit. Day one ended with a drive from Boston to Jamestown, RI, where we set up our base camp. The drive was beautiful. We were worn out, but really excited to see what adventures the week would hold. We said good-bye to Boston, knowing that we would return in a few days for our flight back home. More on Rhode Island next time, but I will leave you with our first glimpse of our new home away from home. In the meantime, Three Friends and a Fork are happy to give Wicked Good Cupcakes and B&G Oysters 3 Patriotic Yums UP!